The Kessler REVOLUTION Pan and Tilt System is the best answer to the need for an affordable, quality motorized pan & tilt head. 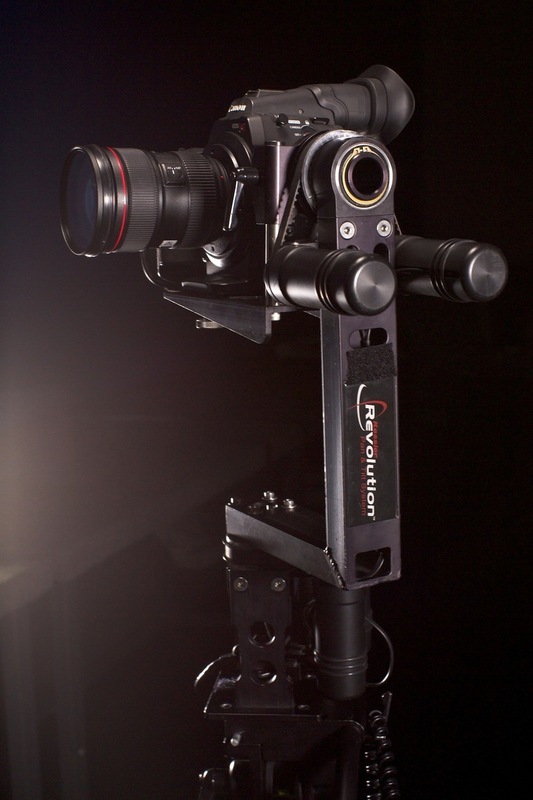 After two years of development, Kessler has produced a motorized head that addresses the failings of other pan / tilt heads in this price range. When paired with the ORACLE Controller, the REVOLUTION is the most feature rich and best motorized head solution on the market, for under $5000. NOTE:You can use the TILT and SLIDER function independently with the same controller. You will need the Crossover Cable & Coupler to access the PAN function while using the slider. – Billet aluminum with stainless steel hardware construction. – Dual motors for each axis, provide zero backlash and 100% holding power (no drifting). – Continuous 360 degree movement on both pan and tilt. – Superior Dynamic Range. Unit is both faster and slower than other heads at similar price point. – Ball bearing and belt drive to eliminate gear to gear noise. – Pass-through axle points, for easy cable routing. – Cabling is with included CAT5 / CAT6 cable with RJ45 connectors (standard network cable). – Unit Weight: 10 lbs. – Weight Capacity: 20 lbs. – Backlit LCD display with menu and setting values. – Fully adjustable controls for Max Speed, Dampening, & Dead Band. – Movement Recording / Memory Function with three memory banks. – Built-in intervalometer with stand alone, continuous motion, shoot-move-shoot, & stop motion modes (requires Camera Control Module accessory). – 2nd axis control while in “Slider” Mode. 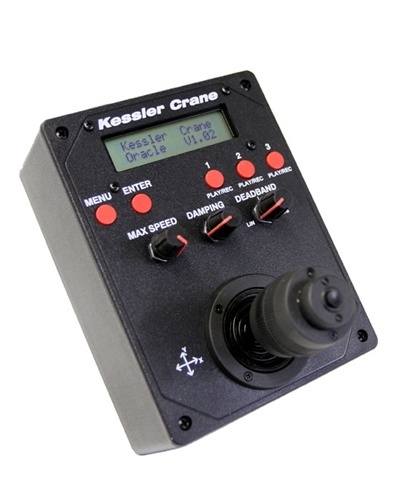 Control slide and one axis of Revolution Head or Turntable with one ORACLE controller. – Cabling is CAT5 / CAT6 cable with RJ45 connectors (standard network cable). NO EXPENSIVE PROPRIETARY CABLES!! – Powered by standard AC power supply with wall plug, or optional 12v DC adapter and battery pack. As of firmware v2.06.1SL, you can control the elektraDRIVE motor of a slider and one axis of the Revolution Head or the Turntable while in slider mode. 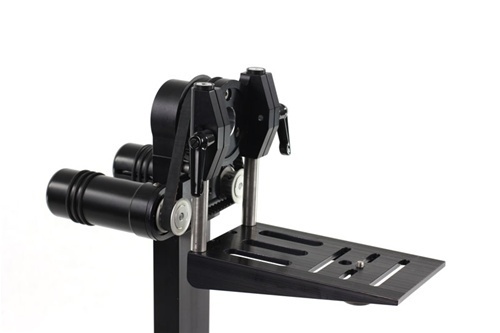 To perform 3-axis movements with both the Revolution Head and a elektraDRIVE motor for a slider at the same time, you will need two controllers. 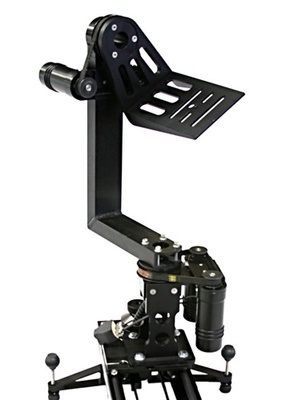 Rent the Kessler Motorized Revolution Pan and Tilt Head from Deck Hand Camera Rentals today!